Pascal Dagnan-Bouveret (1852–1929), Hamlet and the Gravediggers (1883), oil on canvas, 40 x 33.5 cm, Dahesh Museum of Art, New York, NY. Wikimedia Commons. The leading ‘Naturalist’, or social realist, painter of the late nineteenth century in France was Jules Bastien-Lepage. Following his untimely death in 1884, at the age of only 36, that role passed to Pascal Dagnan-Bouveret (1852–1929). In truth, the two were inspiration to one another, without which they would both have been the poorer. But contemporary critics were smitten with Bastien-Lepage, and it was he who stole the limelight, even after his death. Dagnan-Bouveret was the son of a Parisian tailor, who started his studies at the École des Beaux-Arts in Paris in 1869. He studied there with Alexandre Cabanel then transferred to Jean-Léon Gérôme, and showed great early talent. 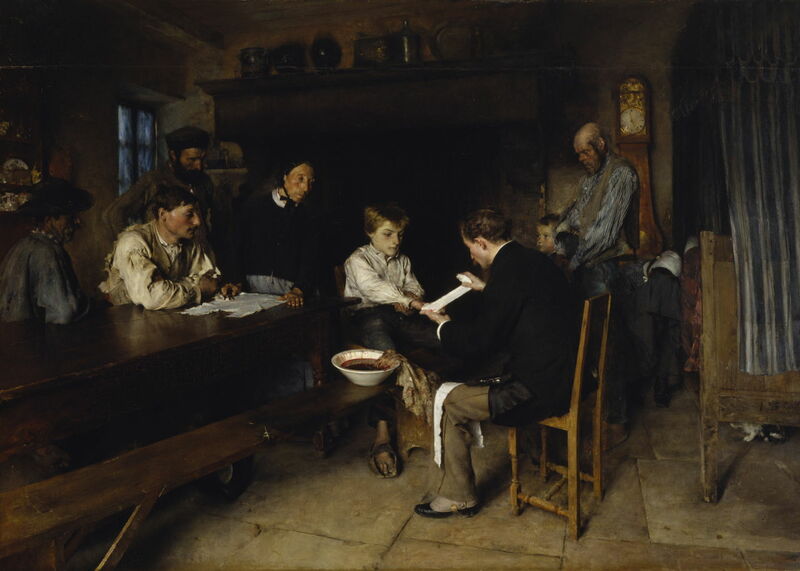 He competed for the Prix de Rome in 1876, coming second, but was influenced by Bastien-Lepage to adopt Naturalism rather than becoming a history painter. Dagnan-Bouveret was also close to Gustave Courtois, with whom he shared a studio for some years. His career at the Salon opened in 1875, following which he became a regular and successful exhibitor there. From the late 1870s he painted frequently in the Franche-Comté region in the east of France, near the Swiss border, where he was able to find the mainly rural Naturalist motifs which he preferred. 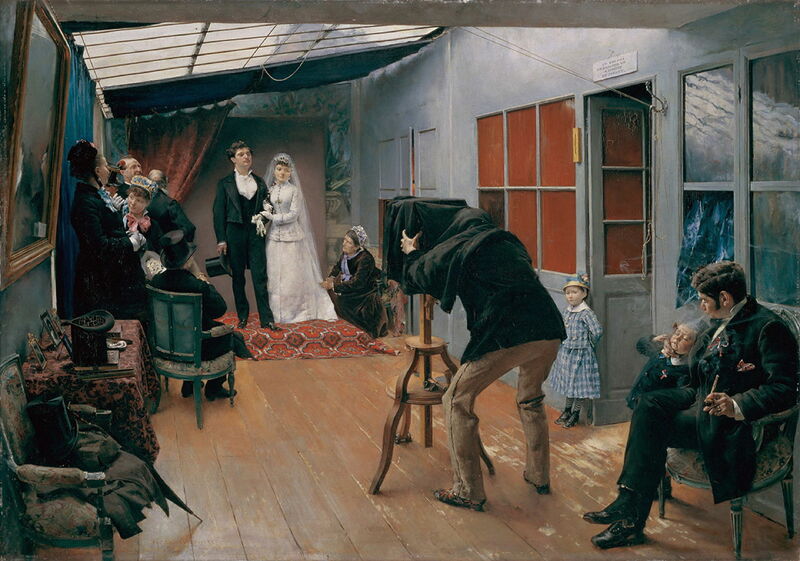 His technical skills are shown exercised to the full in A Wedding at the Photographer’s (1879), where he achieves a highly detailed realism throughout the canvas. Dagnan-Bouveret was calculating in his choice of motif. The wedding market was not one which could be catered for by painters, at least not in the way that photographers were starting to capitalise on it. The image has the appearance of veracity, and uses subtle signs to make photography appear cheap and nasty compared with painting. There is an irony in this painting, in that Dagnan-Bouveret was one of the first painters to incorporate photography into his working methods, later using it in conjunction with more traditional sketches and studies when preparing major works. An Accident (1879) was Dagnan-Bouveret’s first great success in the Salon of 1880, where it won him a first class medal. It shows a country doctor cleaning and bandaging the injured hand of a boy, as the rest of the extended family looks on. Conditions are primitive: the small bowl of water is heavily blood-stained, and the cloth by it appears filthy. Dagnan-Bouveret is supposed to have been recalling an incident which occurred when he was travelling with a medical friend, who was called to help in similar circumstances as shown here. 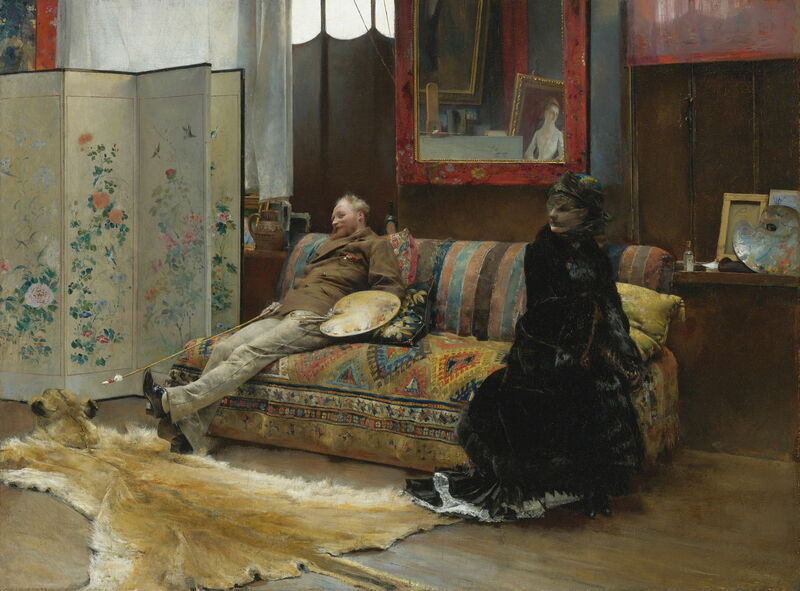 Pascal Dagnan-Bouveret (1852–1929), Bouderie (Sulking, Gustave Courtois in his Studio) (1880), oil on canvas, 48.3 × 63.5 cm, location not known. Wikimedia Commons. Bouderie, which means sulking, is a splendid and intimate portrait of Dagnan-Bouveret’s friend and colleague Gustave Courtois, painted in 1880. Courtois is seen at one end of a large sofa, smiling wrily and staring into the distance. He holds his palette and brushes in his left hand, and what may be a long mahlstick in the right. At the opposite end of the sofa, turned with her back towards Courtois, is a young woman dressed in fashionable clothing, in black throughout, apart from white lace trim at the foot of her skirts. Also shown is a screen decorated with Japanese imagery, and on the floor the skin of a big cat, perhaps a lioness. Courtois is largely forgotten now, but enjoyed considerable success at the Salon. In 1891, he painted a portrait of Madame Gautreau which was deemed far less scandalous than John Singer Sargent’s earlier Portrait of Madame X (1884) – the same woman. Pascal Dagnan-Bouveret (1852–1929), Blessing of the Young Couple Before Marriage (1880-81), oil on canvas, dimensions not known, Pushkin Museum Музей изобразительных искусств им. А.С. Пушкина, Moscow, Russia. Wikimedia Commons. During this early part of his career, Dagnan-Bouveret experimented with various styles and ideas. 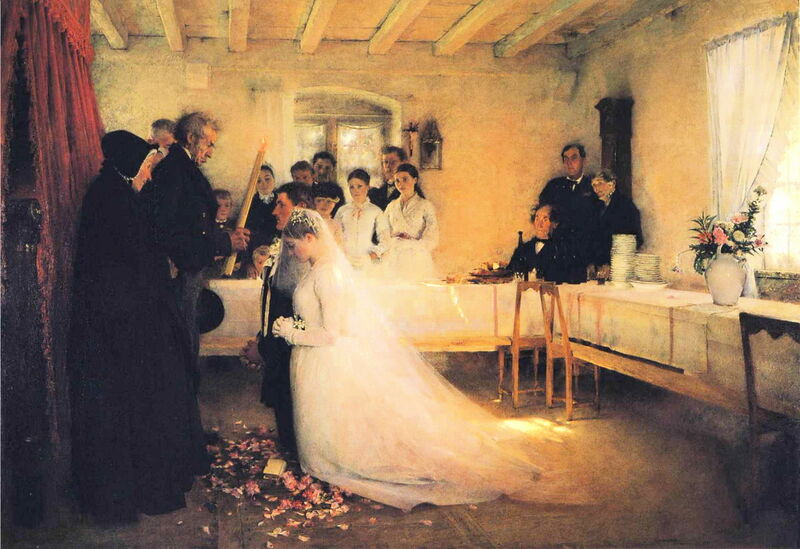 In his Blessing of the Young Couple Before Marriage (1880-81), he looks at a very traditional subject lit by the brilliant sunshine from the right, which almost makes the bride’s dress seem to be on fire. 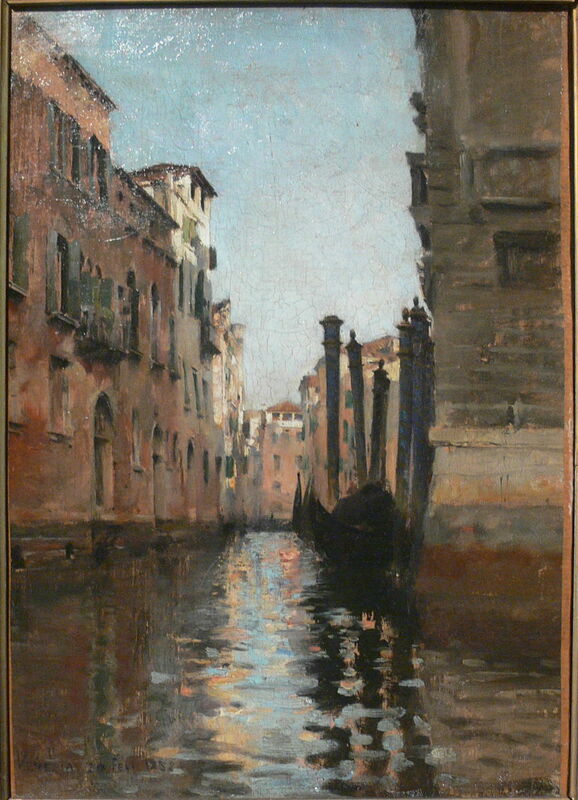 Pascal Dagnan-Bouveret (1852–1929), View of Venice (1882), oil on cardboard, dimensions not known, Musée Georges-Garret, Vesoul, France. Image by Remi Mathis, via Wikimedia Commons. He also visited Venice, where his brushwork was very loose, and his marks painterly, as shown in his sketched View of Venice (1882). This is remarkably similar to the views of Venice painted a few years later by John Singer Sargent. 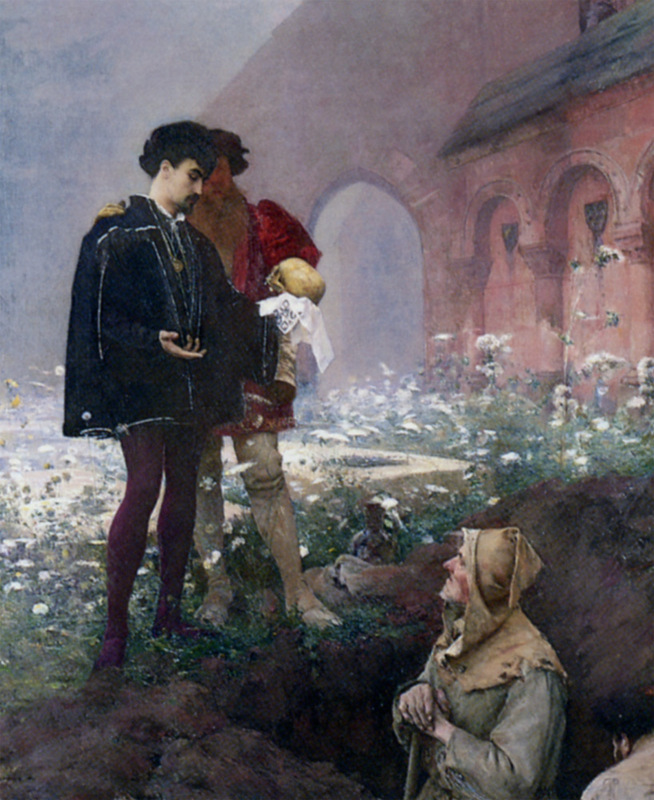 Dagnan-Bouveret also explored some narrative subjects, including Hamlet and the Gravediggers (1883), which shows what is possibly Shakespeare’s most famous scene from his play Hamlet. The prince is just about to lament the passing of Yoric to the gravediggers, against a rich floral background. Then, the following year, Dagnan-Bouveret was shocked when Jules Bastien-Lepage died. After that, he started visiting Brittany to paint. Posted in General, Life, Painting and tagged Bastien-Lepage, Courtois, Dagnan-Bouveret, naturalism, painting, photography, realism, Sargent. Bookmark the permalink.